Mattie's oldest child, Margaret was born in the Bay St. George's area, the rest of the children were born in Bonne Bay. The family tree is only shown to the third generation generally and to the 4th generation in the Matthew Mitchel jr. line to show the connection to my spouse. Ray Neilsen, Mattie's g-grandson from Pasadena NF, recently (Oct. 2002) sent me a copy of a "collage photo of Mattie surrounded by his children as adults. Ray had this made after several years researching photos of Mattie's children. Clockwise starting at the top they are Margaret(Ray's grandmother), Lawrence, Matthew jr., Lucy, Bridget and John. 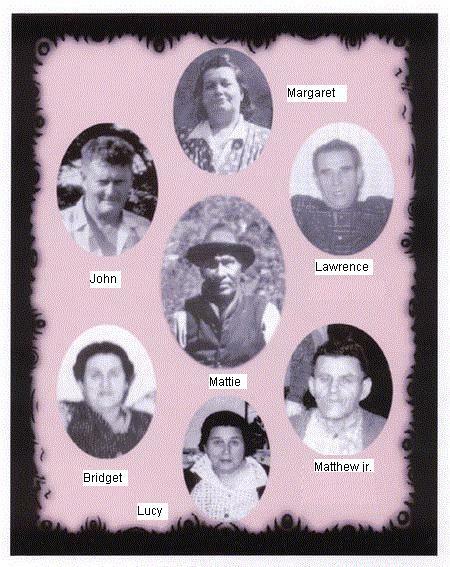 To show Mattie's many descendants would require a separate website. This may come in the future. However I would welcome any updates or additions to the data below. 3 Gordon Sheppard m. Josephine ?